Yoichi Nagashima from SUAC (Shizuoka University of Art and Culture) just presented a lot of the work his students have done over the years using physical computing. 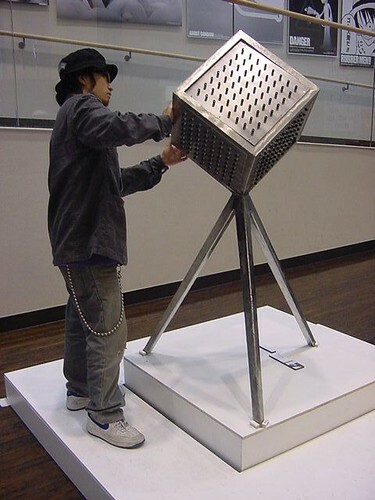 There is a very rich web archive of the work, go look. 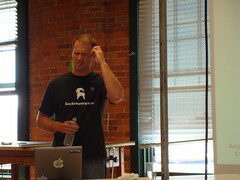 Nathan Seidle, owner of Sparkfun Electronics, thinks very hard about something. I am sitting at the Sketching in Hardware 08 conference, being held this year at RISD in Providence, R.I. This is the third annual Sketching conference, and my third as well. I will be posting links to interesting stuff that gets presented here. My presentation isn't until Sunday so I have some more time to work on it. "Sketching in hardware is the process through which we understand the capabilities of emerging hardware technologies. As digital technology moved into everyday consumer products, the economics of mass production and marketing moved products from open systems that enabled experimentation to closed systems that emphasized ease of production over the ease of consumption. This technology creation culture emphasized scale, a deep understanding of basic electronics and the development of monolithic products designed for use largely in isolation from one another. However, that may now be changing. Miniaturization, power-reduction and knowledge embedding enable smart components that abstract much of the low-level engineering complexity, while keeping the capabilities of the technology accessible and affordable to people outside of heavy industry. This has re-created the possibility of vernacular technology that can be built from smart parts. People who would otherwise be unable to directly engage with digital technology tools can now augment, manipulate, experiment, build, explore. In other words, sketch. " Holy Moly!!!! I've been so busy getting ready for the annual Fire Arts Festival that I forgot to tell you all about it. Two more nights left - tonight and tomorrow. 7th Street, West Oakland, Near BART. Loads of pix online already. More info at The Crucible's website. July 12th, 3PM until 8PM. 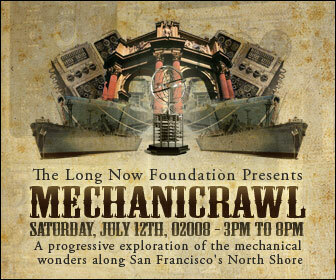 A great way to support these mechanical marvels of San Francisco is through their membership programs; links can be found under Main Attractions at the Mechanicrawl site. "Mechanicrawl is a progressive tour through the mechanical wonders of San Francisco's North Shore showcasing several amazing machines that are usually not available to the public. You'll be able to map your own route to see the giant running steam engine aboard the SS Jeremiah O'Brien, one of the most complex mechanical computers ever built, The Torpedo Data Computer aboard the USS Pampanito Submarine, turn of the century automata, over 200 coin operated machines and video games at the Musee Mecanique, the Orrey, Solar Synchronizer and new Walking Bearing at The Long Now Museum and Store, special films and exhibits at the Exploratorium and more!" More info at Make's site. Nemo Gould has a solo show, "Second Hand Made", coming up at the Lois Lambert Gallery in Santa Monica. It opens on July 12th. Nemo has been creating a whole new body of work in preparation for the show, and he will be showing some old favorites as well. We wish him the best on his first show in SoCal. If KineticWorld can scrape up some gas money we'll try to make it down there to cover this show and the Device Gallery show as well. Of Nemo's new works, I have to say that "Fat Brasstard" is one of my favorites - it can be seen here.